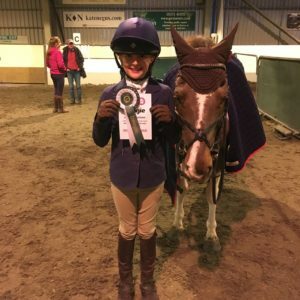 My aim for October was to try and qualify both ponies for the Area finals of The Pony Club Dengie Winter League Novice Dressage. The first qualifier was at West Wilts Equestrian Centre and it was a very wet and cold day!! Chico warmed up really nicely and was feeling very relaxed, but just before we went in to do our test a flock of Canada geese flew low over the arena which really upset him. I managed to calm him and was just about to start the test when the flock flew back over the arena, this was just too much for Chico and although we completed the test it was very tense and he didn’t score very well. Felix was Mr.Cool and even though he doesn’t like wind and rain he did a lovely test to come 3rd with a score of 70% and qualify for the next round. Before we went to the next qualifier I was lucky enough to have a lesson with Olivia Towers (one of my idols!!) I took Chico and he was a superstar! Olivia helped us out loads and Chico felt amazing! So I went to the next competition feeling like we could really improve on our previous outing and Chico didn’t disappoint me….he did a super calm test to come 3rd and qualify with 66%, so that was Mission Accomplished for October! 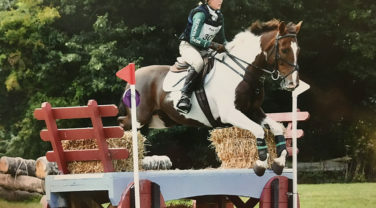 Having achieved what I wanted to do in the dressage we then concentrated on show jumping, we took Felix back to West Wilts for The Pony Club Dengie Show Jumping qualifier competitions and my aim was to try and qualify for the 80cm Debut class. Felix jumped a super clear round to come 5th but just missed out on qualifying. As he was jumping really well I thought I would have a go at the 90cm class. This was our first 90cm course and Felix jumped a lovely round with just one pole down, but we qualified for the next round!! I was over the moon with him!! Chico has been doing lots of jumping practice at home and will hopefully soon be ready to go out and do a SJ competition. He tends to get a bit keen with his jumping and can get very fast and strong, so we have been doing lots of grids which does seem to be helping so watch this space! October was also an exciting month because the ponies moved in to their new stables and I am very grateful to Dengie for the lovely drawstring bags which I keep the ponies grooming kits in outside their stables. Now that the clocks have gone back it’s getting much harder to ride both ponies everyday, I try and ride one of them before school and one after. They are both looking and feeling really well thanks to their Dengie diets. We have added Dengie’s Digestive Health Plus supplement to Chico’s feed as now they are in the stables more he can get a bit wound up at times and the prebiotics will help to keep his tummy healthy. Over the next few weeks I am hoping to take both ponies arena XC schooling and we may also have a go at some intermediate dressage for the Pony Club Dengie Winter League, as well as hopefully taking ‘pocket-rocket Chico’ show jumping! My First Blog by Maisie Randle! I’m Maisie and this is my first blog and I’m very excited to be writing it as an ambassador for Dengie! I hope you enjoy following me and my 2 ponies, Felix and Chico.